Environmental journalist and author Michael Grunwald, writing in Foreign Policy’s special report Oil: the Long Goodbye, takes on the “Seven Myths About Alternative Energy.” Grunwald is less sanguine on the prospects for using alternative energy sources such as biofuels, solar, and nuclear power than using energy efficiency and conservation to reduce fossil fuel reliance and greenhouse gas emissions. Regardless of the efficacy of the seven now-common alternative energy narratives that the author identifies, the Department of Defense, the largest U.S. energy consumer, is moving along with many relevant plans and purchases. Let’s take a look at how DOD activities align with Grunwald’s piece. By not later than December 31, 2016, the Air Force will be prepared to cost competitively acquire 50 percent of the Air Force's domestic aviation fuel requirement via an alternative fuel blend in which the alternative component is derived from domestic sources produced in a manner that is greener than fuels produced from conventional petroleum. Indeed, this requirement reflects the Air Force’s own energy strategy. To aid in this effort, the Defense Advanced Research Projects Agency (DARPA) has been working on producing JP8 jet fuel by converting “‘yellow grease oil’ or plant-based ‘cellulosic and algae sources’” into a low-cost scalable alternative for the USAF to reduce its fuel burden. While Grunwald cautions that we must maintain vigilance when using “farm-grown fuels” as a substitute to fossil fuel due to the very real security concerns – synthesizing biofuels from crops may worsen food issues, exacerbate grievances, and cause instability and violence in countries throughout the world – DoD has been careful in its selection of bio- and synthetic fuel options. Grunwald also discounts the role that “algae, trash, agricultural waste,” and other next generation fuel options might play in securing America’s energy future, as the technology is usually “‘several’ years away from large-scale commercial development.” But for DoD, large-scale commercial development is merely a welcome byproduct of its smaller-scale internal efforts to reduce its dependence on fossil fuel and meet its legislative requirements. And needless to say, if America’s largest consumer of fuel can demonstrate feasibility, even on a small scale, it could be an indication to the private sector that the technologies are well worth the investment – especially to scale up to become commercially viable. Of course, one area on which Grunwald and DoD can certainly agree on is efficiency. As Grunwald writes, efficiency “won’t take years to build or bring to market; it’s already universally available.” For the reader, it is clear that the author puts more stock in energy efficiency than in alternative energy technology. But DoD has been taking both approaches, combining alternative energy with efficiency measures in bases at home and in forward operating bases abroad, where decreasing the logistics burden of transporting energy is a high priority. The Department has been working on developing “NetZero” forward operating bases that would integrate new energy technologies like solar power along with improved efficiency facilities and appliances – such as “domes, Spray-Foam insulation, renewable power generator, efficient heating, ventilating, and air conditioning systems” – allowing the bases to operate self-sufficiently and reducing the demand for vulnerable fuel convoys often subject to roadside attack. With more than 570,000 domestic facilities, DoD has been adding solar power generation and other alternative energy projects with improved efficiency standards. By 2014, a 500-megawatt solar power facility is slated to provide Fort Irwin with all its energy needs, for example, in addition to meeting annual Congressionally-mandated efficiency improvements. And as bases are often the size of small cities, DoD‘s efforts might even serve as models for the rest of the country. Alternative fuels are not necessarily magic bullets for energy and climate security. But putting all biofuel and synthetic-based fuels into the same basket undermines the serious efforts that DoD and others are having in helping to improve energy security by using viable, less onerous, and more sustainable fuel options. Furthermore, by focusing on large-scale development, one negates the importance that small-scale improvements can have in transforming behavior writ large. Grunwald concludes with a rallying cry for American leadership to say to the rest of the world – especially developing countries – “Do as we’re doing, not as we did.” And the first step to international leadership in this case is to rally the will at home. On this, DoD is already helping to lead the way. Photo: An F/A-18E Super Hornet on the USS Nimitz. 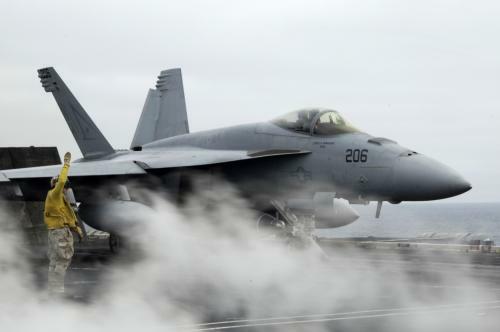 The U.S. Navy is preparing to conduct a biofuel test for its F/A-18 Super Hornet using biofuels derived from Jatropha and algae, two renewable and sustainable fuel options the Navy has been experimenting with to reduce the Super Hornet fleet's reliance on fossil fuel. Courtesy of Mass Communication Specialist 3rd Class John Philip Wagner Jr. and the U.S. Navy.